“Question of the Week” on the Warped Weavers Forum asked us if our finished projects always measured up to what we had envisioned. It is interesting for me to think about this and see how my ideas about the larger projects on which I have been working lately have evolved during the long process of weaving. I have been spending months planning and weaving these wall hangings, often interrupted by a break of several more months while I travel. I look back at my notebook with its sketches and glued-in pictures and can see how far the finished pieces sometimes stray from the original idea. Sometimes it is a technical hitch that does not allow me to create what I had envisioned. 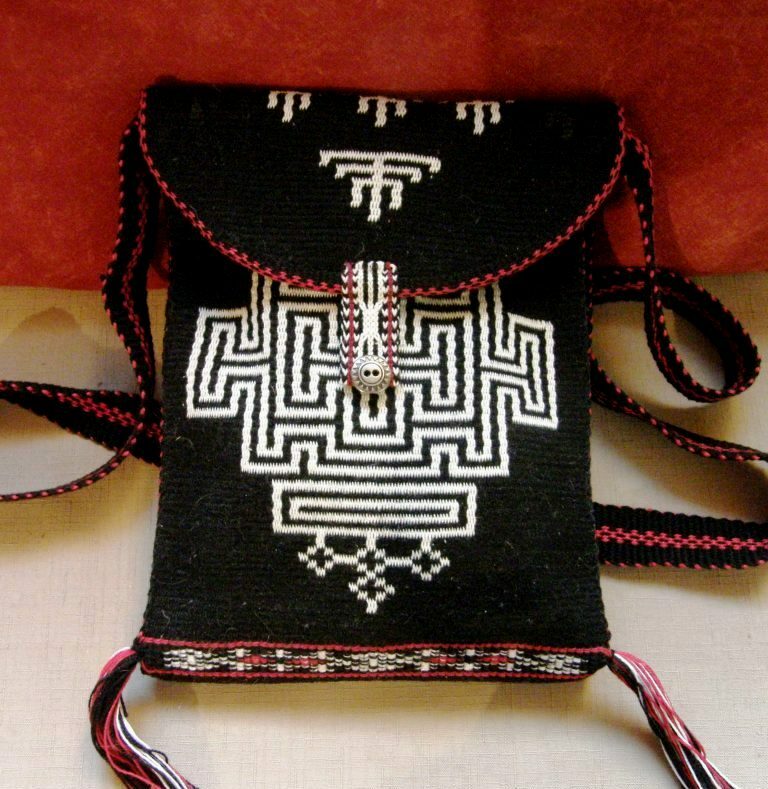 For example, I had wanted the Shipibo-inspired piece to comprise only curves but could not manage to form nice smooth curves with the thicker solid lines in double weave. That had almost caused me to abandon the idea. But, I went with a strong angular outline filled with finer curves instead and I really like that contrast. Sometimes, in the middle of a project something will catch my eye online, or someone will show me something and I will want to add those ideas to the mix. That is what happened with my Tales of the Sub-Continent fabric which started with a Bhutanese-inspired motif and spread to Afghanistan, Nepal and beyond. Sometimes it works, sometimes it doesn’t. When it doesn’t, it goes into the closet. And this is one of the many cool things about backstrap weaving…my half woven projects can be easily removed, still on their metal rods, from the loom bars and stored. I can discover a project months later, pull it out and wonder why on earth I hadn’t liked it! Then it can be easily lashed back onto the loom bars and continued..
It’s like in the old days before digital cameras. I never wanted to process my rolls of film until at least three weeks after my trip. If I got impatient and processed them straight away, I would always be disappointed with the shots. They didn’t live up to my fresh memories of the things I had seen on the trip. The colors would not be as brilliant and they wouldn’t have captured the mood. However, just a few months later, they would look fantastic as my memory of how things had looked and felt faded. I detested the above fabric when I first wove it. It was a demo warp that I had hastily put together before a trip. I wanted something fun, bright and cheery in place of the black that I am so often using. It didn’t come out as I had envisioned and I didn’t even take it out of my bag to show anyone as I thought it was so ugly. 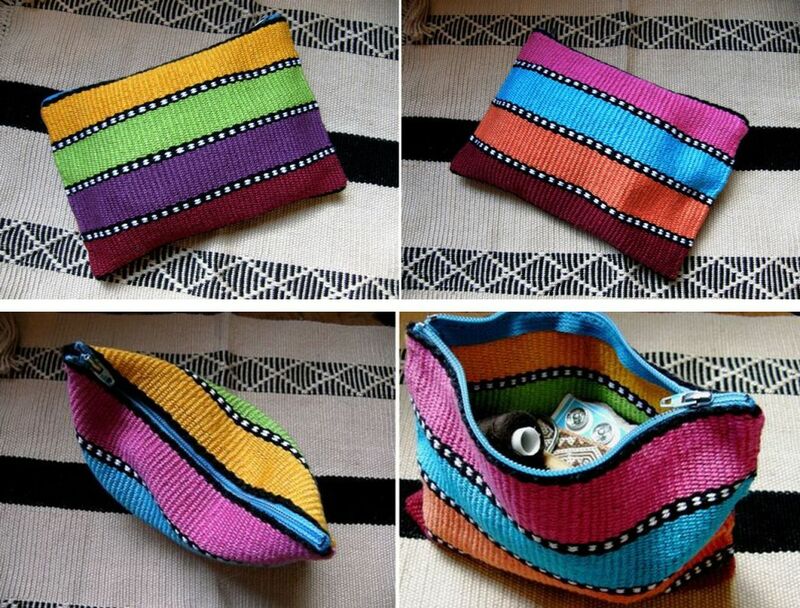 Now I love the fabric, the original idea has been long forgotten, and the little sewing kit pouch is really useful. This fabric has also been living in the back of the closet for the longest time. I wove it to practice what I had learned in Guatemala shortly after returning way back in 2008. Now I love it and need to make something from it. There have been a few things that simply didn’t work as far as I was concerned and those things got tossed. But, I have to wonder how I would feel about them if I were to uncover them in the closet today. If there isn’t even a picture of it, it means that I must have really hated it! All this is leading up to my telling you that I have been walking by last week’s forlorn, rejected ikat piece, which has been sitting on a bench in my bedroom all week, and finding myself eventually wondering why I hadn’t liked it. Of course, there’s a whole blog post dedicated to why! But, I finally decided that I could unweave some parts and improve it somewhat. So, here I am weaving away on that piece again…and not just to get it of the loom and learn more lessons…no, it’s because I actually like it now despite its flaws. I spent most of the week washing yarn to take of the wax finish, setting it up on a frame and wrapping it for a new slightly larger ikat motif. I was very excited about this new larger motif and really wanted to weave it. However, I had to face the fact that I didn’t have any black cold water dye left. In the end, I couldn’t resist trying to achieve black by mixing colors. Well, it looked black in the bath and even looked black while it hung to dry. However, the rinse water certainly wasn’t black and the dry cloth has a purply reddish glow. It is kind of like the color of those big, fat, juicy, ripe mulberrries on the tree. They look so black and shiny but your hands and lips stain purply-red (which is why my brother and I could never get away with eating from the forbidden tree in our backyard as kids). I almost unwrapped it but I will wait until I return from my next US trip with fresh supplies of dye and I will overdye this warp black. That warp has to go on the back burner for now. What will be interesting, will be seeing what colors have already seeped under the wraps. 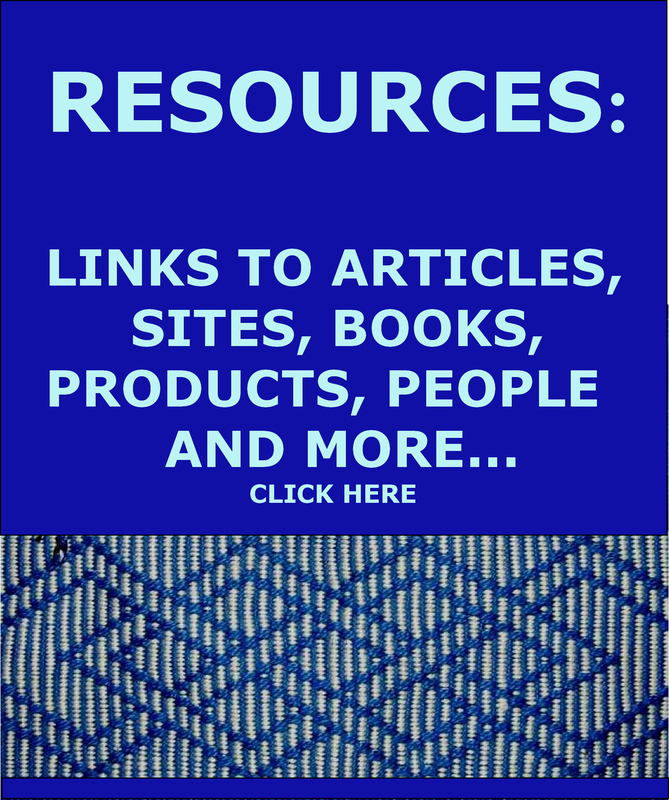 Here’s some online inspiration for more and more ikat experiments…lots of reasons to keep at it! Photo used with the permission of the Ministerio de Cultura de la Nación Argentina. 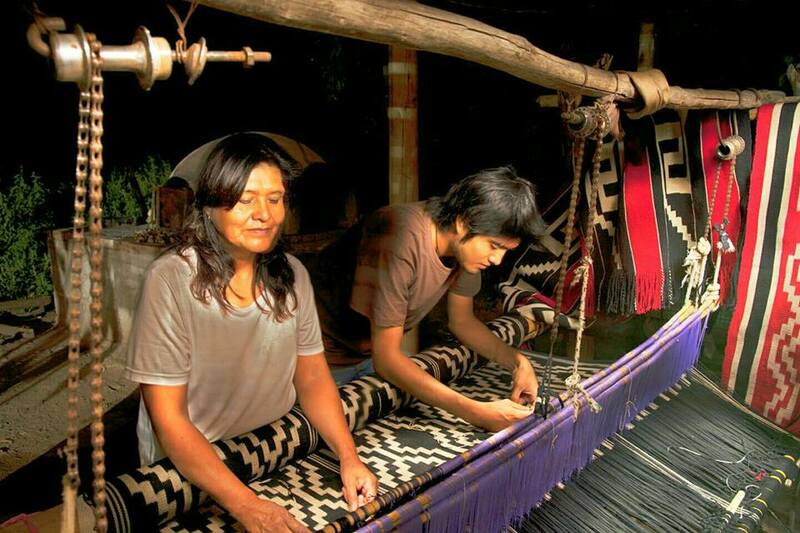 The ikat poncho was woven by Guillermina Cabral. Ponchos on and off the runway…. 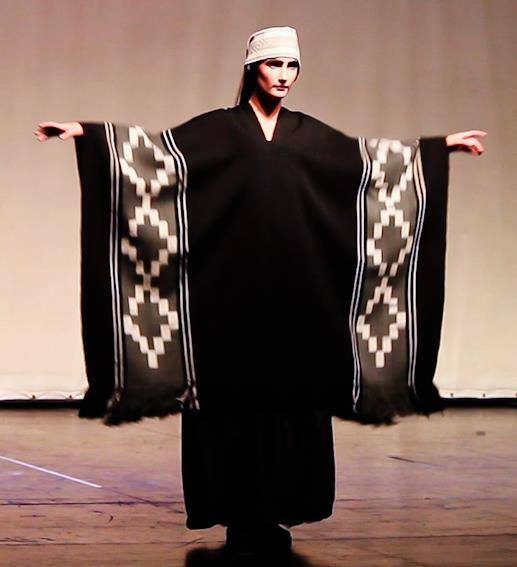 Don Juan Millain shows a ponch woven by Norma Millain. 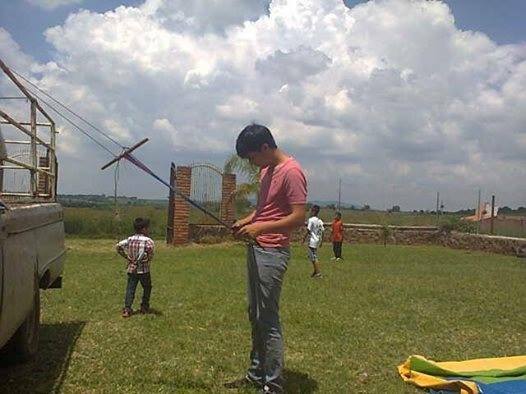 Photo from the Facebook page of MATRA – Ministerio de Cultura de la Nación Argentina. And here’s my wee, wobbly project being slowly fixed…straightened on one side, and now with white embroidery floss for supplementary weft which looks so much better than the creamy colored silk I was using last week. Chris Buckley, in Beijing, has shared many images with me over the years from his vast collection of textiles. 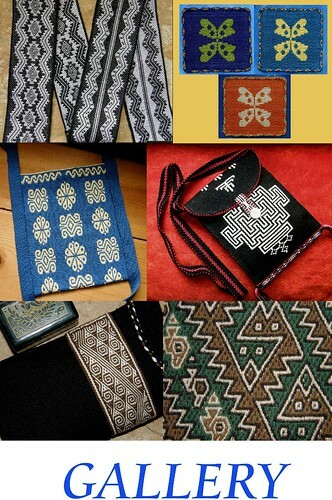 I was happy to find his Art Southeast Asia page on Facebook recently, via a weaving friend, and see the picture of Li ikat weaving that he had posted. He has just had an article on these pieces published in the September issue of Textiles Asia (I have a copy coming my way). There were a lot of tiny wrapped sections in his piece! and the seeping of the indigo into the white has created a nice effect. Using handspun cotton…now that’s a whole other trip. 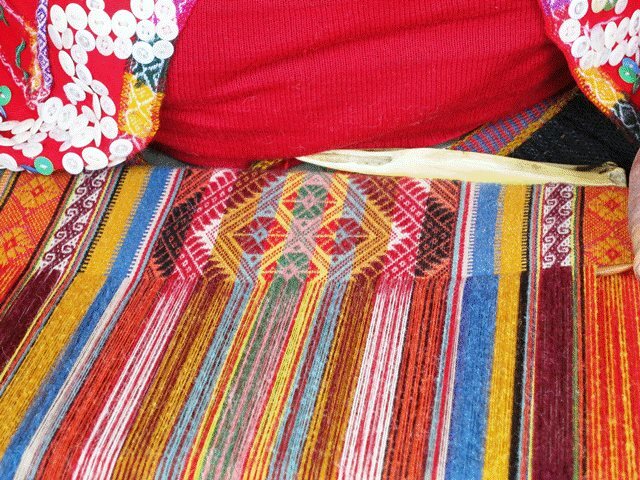 The September 2014 issue of Textiles Asia (www.textilesasia.com) includes my article on ikat made by the Meifu Li people of Hainan. 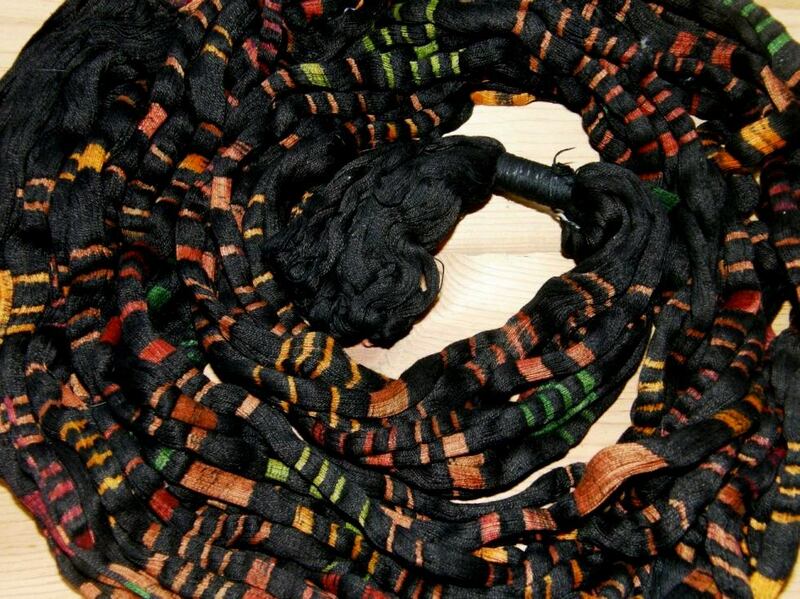 The Li make dense, complex and beautiful ikat, using locally grown handspun cotton and natural indigo dye. The designs are tied on the warp threads with small strips of resist, before the yarn is dyed. 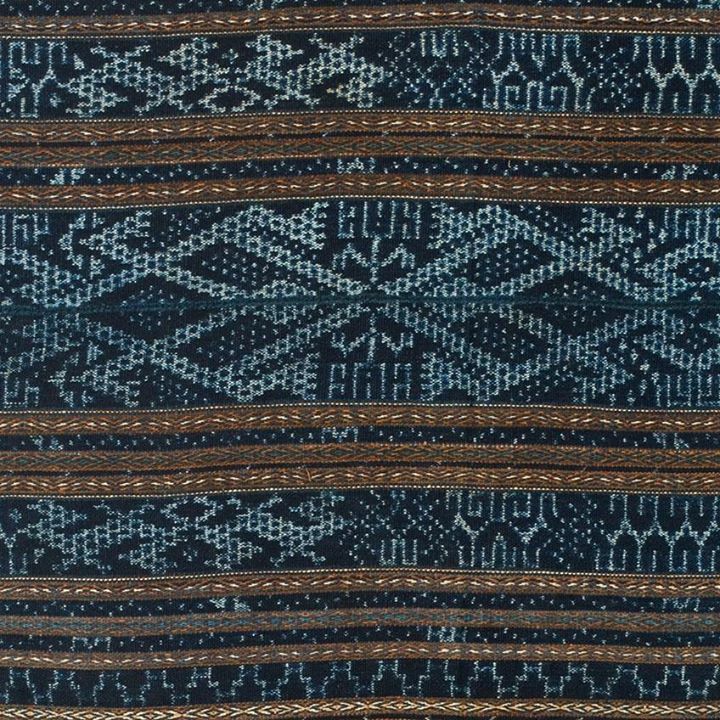 The dyed threads are woven on a simple backstrap loom, so that the designs appear in white on a deep blue background on the finished fabric. Motifs include geometric forms, human figures and amphibians, such as those in the photo here, which shows a detail of a large sarong. These were mainly for ceremonial use (weddings and festivals). The Textiles Asia magazine is excellent and I recommend it to anyone with an interest in this area. You can watch a short Youtube video here showing the ikat process with string and masking tape used by some weavers in Argentina. I think they are very brave to use that heavy marker pen! I tried using a fine-tip marker and the ink bled into the yarn. Now I use faint pencil marks. 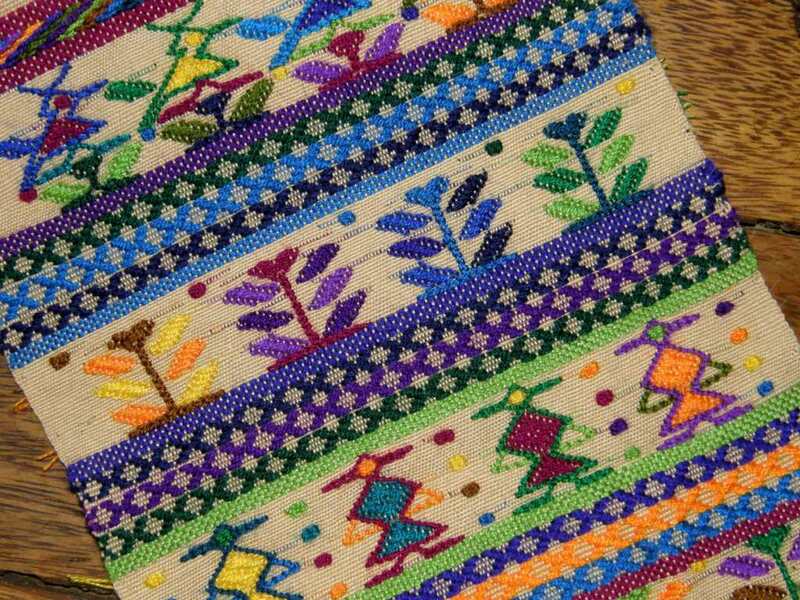 A booklet that I have on Guatemalan ikat, known there as jaspe, says that the person tying the knots marks with a pen the parts that need to be reserved. Most likely they are less prone to making mistakes than I am! A Guatemalan jaspe warp ready for weaving. 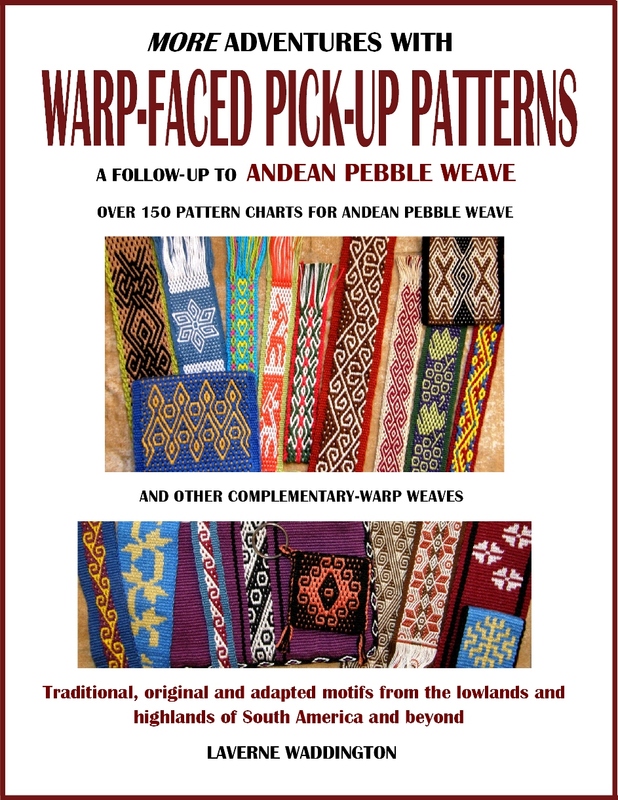 Leaving ikat aside for now, let’s look at some other kinds of backstrap woven beauty. 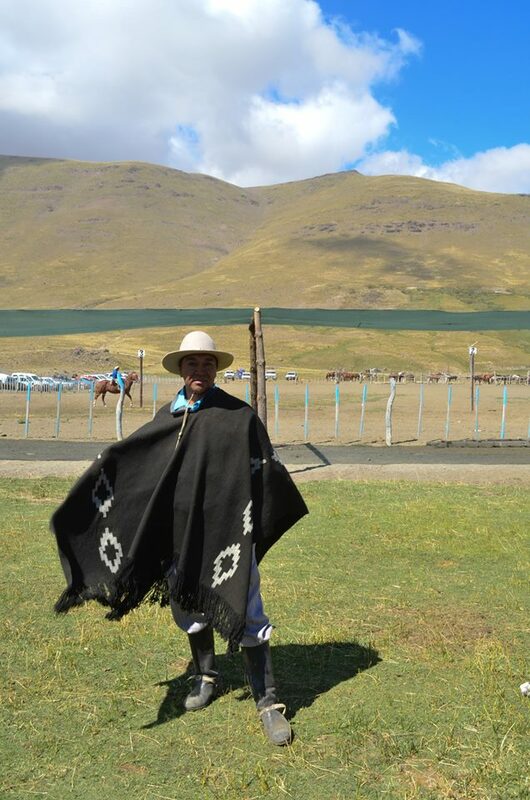 Gwen shared with us pictures of the beautiful pick-up weaving that she saw on a recent visit to the Cusco area of Peru. I appreciate her having taken this next picture of the process of braiding the ends of the backstrap and inserting the cord. I didn’t use a picture of this in my article and I know that Gwen’s picture will make the process very clear to those who may be unsure. 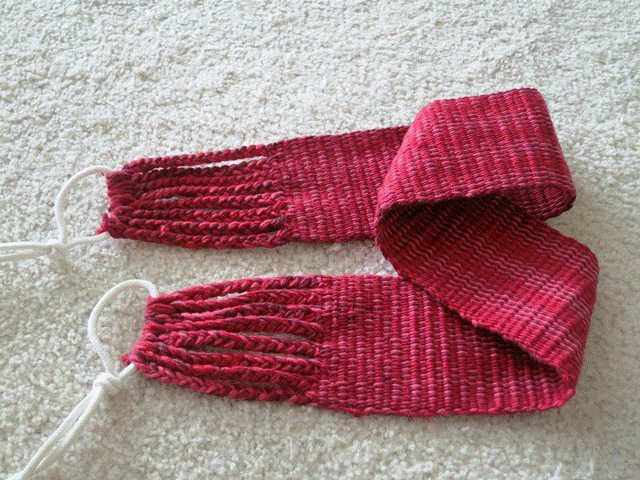 …weaving outdoors on a warm sunny day. 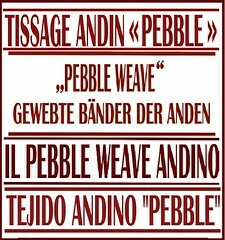 Oscar Vasquez tells me that he doesn’t live in a part of Mexico where backstrap weaving is practiced and so, he has been following the same WeaveZine article that Gwen used (the Spanish translation) to weave a narrow band while out and about. 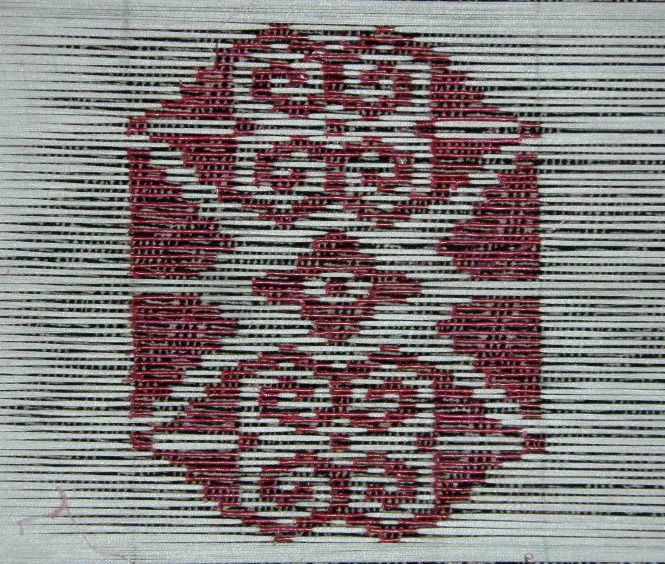 This coming week, I hope to warp the two red panels that will accompany the central ikat panel of my planned wall hanging. 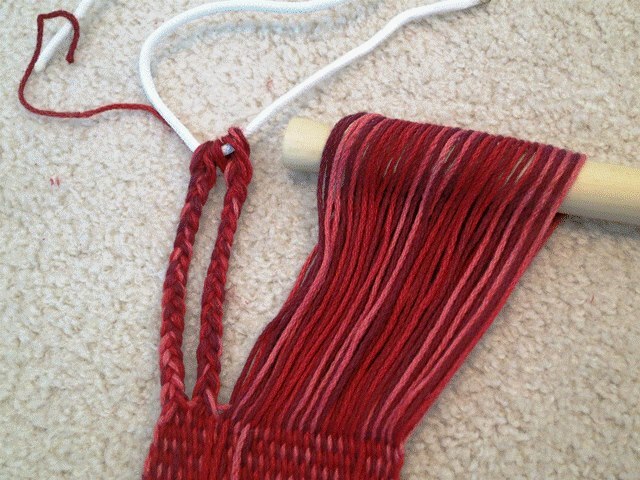 I will create another red-on-red pattern using simple warp floats. 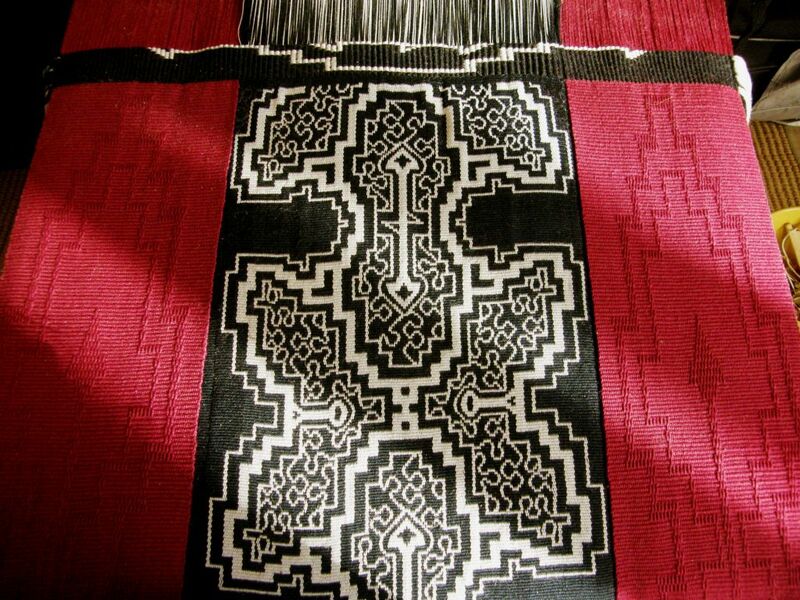 The motif will have elements of that used in the ikat panel. 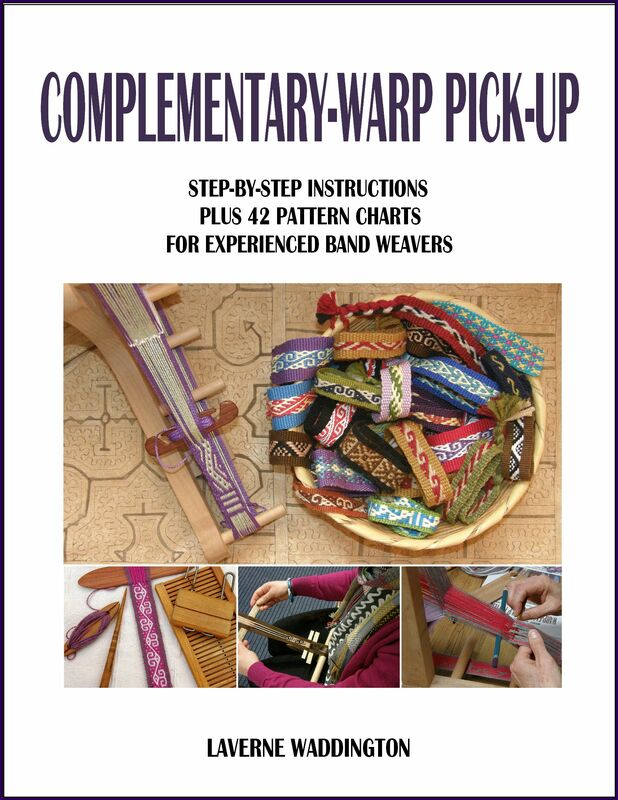 « Backstrap Weaving – If I were to do it over…. wow, thanks for that video link, they make it look so controllable. i think i’m ready to try again!